When journalist Prageeth Eknaligoda went missing, police told wife Sandhya ‘getting abducted was fashionable’ and he would soon return. More than 90 court appearances and a change in government later, she is still searching. Sandhya Eknaligoda has had a date at court in Homogoma, Sri Lanka, every month for the past six years. The 52-year-old counts the number of appearances at more than 90 and they are aimed at securing one thing – finding her husband. Journalist and cartoonist Prageeth Eknaligoda disappeared without a trace on 24 January 2010 after a mysterious telephone call led him to an equally mysterious meeting. Since then not a word has been heard from Prageeth, who was 50 when he disappeared, not even from third parties. He worked for website Lankae News. The Eknaligoda case is one among tens of thousands of missing persons cases that the new government of Maithripala Sirisena has pledged to resolve. A presidential commission has already recorded more than 20,000 such cases, including more than 5,000 security services members. “I will go anywhere, any time to get information on Prageeth,” says Sandhya. And she has – from court hearings in Colombo to sessions of the UN human rights council in Geneva. It is a marathon endeavour to seek justice for her husband. But it has not endeared her to some. Last week, as she was leaving court, she was accosted and allegedly threatened by a prominent monk. The monk, Galagodatte Gnanasara, heads the nationalist movement Bodu Bala Sena (Buddhist Power Force). He had come to court with several other monks to offer to be remanded in place of six security personnel taken into custody over the abduction of Eknaligoda. He accused Sandhya of tarnishing the name of the armed forces by alleging that her husband had evidence of use of chemical weapons. Such brickbats aside, Eknaligoda told the Guardian that in the past year, since president Sirisena and his prime minister Ranil Wickremesinghe took office, investigations into her husband’s abduction have made progress. The investigations have revealed links to the military and a camp in the north east where the journalist is suspected to have been transported. Members of the government of the then president Mahinda Rajapaksa also alleged the missing journalist was domiciled in a foreign country. Lawyers and the Eknaligoda family believe the journalist was abducted due to his work in the campaign of then opposition presidential candidate General Sarath Fonseka. He was developing a booklet entitled Pawul Gaha (Family Tree) on the nepotism prevalent within the Rajapaksa administration. That, and other cartoons he had produced, were on a USB stick that he later lost. Sandhya suspects that USB drive, with its anti-Rajapaksa propaganda, was the trigger for the abduction which took place two days before the election that Rajapaksa won. The new administration has pledged to set up a national office for missing persons that would undertake tracing and compensation and also change national laws to allow for the issuance of certificates of absence. However, not a single person listed as missing has been traced since the new government took office. Recently, the prime minister told a public gathering in northern Jaffna that he feared many of those missing could be dead. 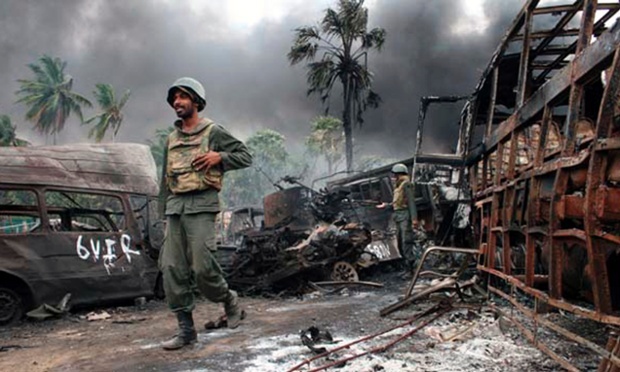 A 2011 report by an advisory panel to UN secretary general, Ban Ki-moon, said more than 40,000 could have perished in the last bouts of fighting between government forces and the Tamil Tigers from 2008 to 2009. The domestic advocacy body, University Teachers for Human Rights (Jaffna) put that figure as high as 90,000 earlier this year. Ruki Fernando, a prominent human rights activist who works with national advocacy body Inform and was briefly jailed in 2014, voiced frustration with the pace of change. Those who have been looking for missing loved ones say that at least now they can do so without fear of persecution. “There was a time when looking for my husband was a far greater crime than his abduction,” says Vallipuram Amalanayagi, a 41-year-old woman from the eastern Batticaloa district who has been looking for her husband since February 2009. He was paddy farmer who went missing while returning home from his field.